True Ecuador Travel . . . Explore Ecuador's history and culture while you learn Spanish! Explore the Amazon, Andes & Galapagos! Individual and group tours and bespoke itineraries. 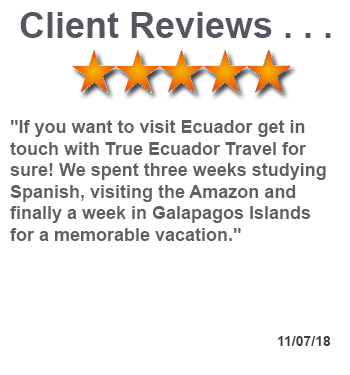 Responsible travel in Ecuador, custom itineraries, Galapagos & Amazon tours, Spanish courses, academic and Study Abroad programs, cultural journeys and more! Ready to get away? Looking for inspiration? Well Ecuador has it all. Let True Ecuador Travel craft the perfect vacation package to make the most of your precious time. Ask our experts to create your dream itinerary! Combined packages for Individuals and Small Groups to explore Ecuador! Exciting individual, family and small-group tour programs that offer Spanish classes, learning, cultural travel, adventure and more! Explore Ecuador through its language, its peoples and its stunning geographical diversity! Click for more educational travel options. Explore the unique and enchanting Galapagos Islands, either on a 4 - 14 day boat cruise or one of our economical land-based tours that hop from island to island. 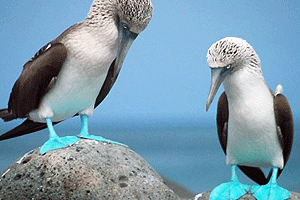 Visiting the Galapagos is a once-in-a-lifetime adventure that is on everybody's bucket list! 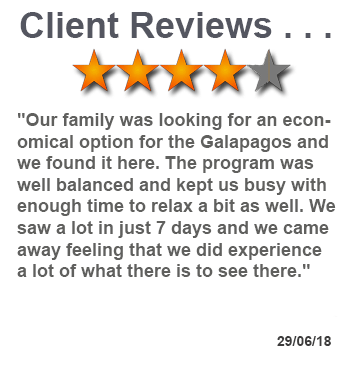 Click for more Galapagos tour information. 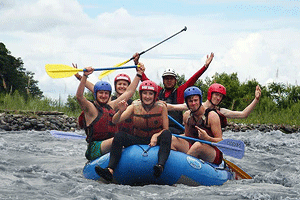 Adrenaline adventures on water or land all over Ecuador! Whether you want to climb the (literally) breath-taking volcanos of the Andes, brave the white waters of Ecuador's inumerable rivers, explore the deepest Amazon, or dive with sharks in the Galapagos we have just the program for your inner explorer! We can create the perfect adventure combination. See what adventures we recommend! Let us suggest the perfect study program for your institution - combining service learning and study abroad with exploration of the rich biological and cultural diversity of Ecuador, adding in Spanish classes if needed - to produce the perfect learning program for students of all interests and disciplines. 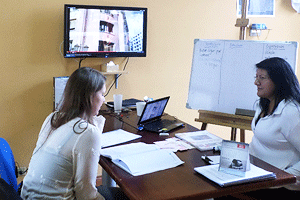 Take Spanish classes with us in our schools in Quito and Cuenca, or explore Ecuador with your own teacher. We have language courses for all ages and skill levels and study programs for all interests, from one week crash courses and upwards. 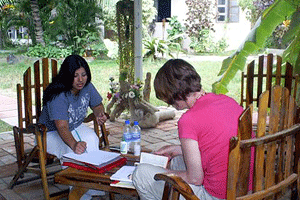 Learn more about Spanish language travel! 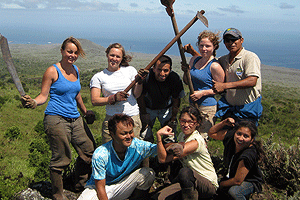 Volunteer and Gap Year programs for all ages and interests . . . Traveling with a conscience and giving something back to those less fortunate creates bonds and lifelong memories. Choose from over 35 different volunteer projects and find one that fits your skills, preferences and availability. Volunteer in Ecuador! Find out more about volunteering in Ecuador! 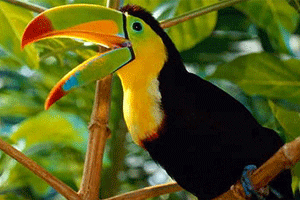 Explore the Amazon rainforest and cloud forests of Ecuador! Home to immense and still unknown biodiversity, the Amazon rainforests and cloud forests will amaze and inspire you. Whether you want to feel like an explorer or stay in a luxury lodge, we can offer the perfect travel itinerary to explore the Amazon your way! See our Amazon travel recommendations! 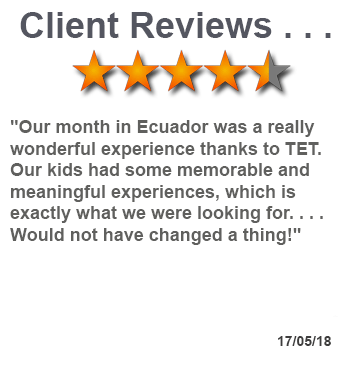 Educational travel implies visiting a country like Ecuador with the aim of actively learning about it - its history, its environment, its culture, society, politics, or any particular theme of interest as an inquisitive traveler. It is tourism with an educational slant, giving a different meaning to the journey that one undertakes. Ethical travel implies that the traveler has a sense of the impact of their journey on the environment and their presence on the places that they visit. It is also called responsible travel, and issues such as the imbalances and interconnections between developed and developing countries, the impact on the environment, issues of human rights and social development all affect the decision of where to travel. 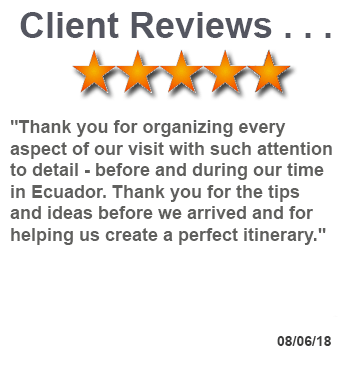 Ecuador offers a wide range of experiences and insights to the ethical traveler and True Ecuador Travel will be delighted to help you create a fulfilling program. Profits from our operations are invested in the ongoing projects of our foundation - Yanapuma Foundation - working with indigenous and marginalized communities to promote sustainable development. Our projects have included education, health and nutrition, reforestation, cultural preservation and language rescue, sustainable economies, sanitation, vegetable gardens and improved cacao production. 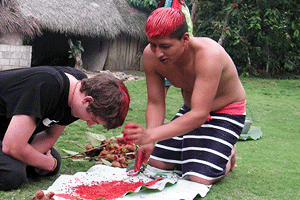 Traveling with True Ecuador Travel offers a way to travel ethically and responsibly. Ecuador is a microcosm, encompassing a huge variety of geographical environments in very close proximity in addition to a wealth of disctinct cultures who have formed unique relationships with these environments. From the Amazon jungle in the East, to the spine of the Andes Mountains down the center, to the Pacific coast on the West and the Galapagos Islands archepelago in the Pacific ocean, there is so much to see, and one can travel from snow-capped volcanos to cloud forest or jungle in a matter of hours. And with over 17 distinct indigenous groups with 14 unique languages, there is a wealth of culture to explore and learn about. 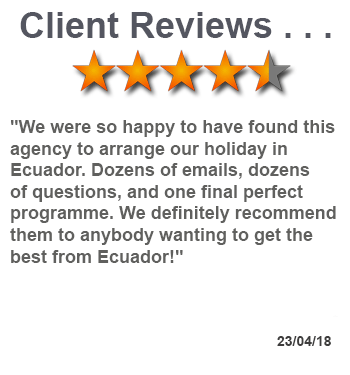 True Ecuador Travel is a full-service travel agency and tour operator in Ecuador that is the travel arm of Yanapuma Foundation, a non-profit NGO formed in 2006 with the mission to promote sustainable development in indigenous and marginalized communities around Ecuador. We operate on a "social enterprise" model, generating income from our own operations to fund our own project work. Yanapuma also runs a Spanish school with two branches - one in Quito and the other in Cuenca - along with a volunteer department that receives international volunteers and groups to carry out development projects around the country. These initiatives also make a valuable contribution to our work both financially and through direct work on projects. The lodges, programs, tours, and projects that we offer on these web pages are all chosen for their high standards - ethically and environmentally, as well as for the general standard of service that they offer the visitor. We recommend them based on customer feedback and their well-earned reputation for excellence. Throughout the year in Ecuador there are events and changes of season to take into consideration when planning your trip.